This blog was originally written on 15 February, 2010. Few days back, i tired to see if my DBK31 camera can image our nearest white dwarf, 8.6 light years away, Sirius B. The results (right image) were interesting and in the final processed image, i could see Sirius B (about 8.5 magnitude star), a left over bright core of a long dead huge star, as a speck right under Sirius A (brightest star in the sky with a magnitude of -1.46). The test image was a stack of 3,000 images and was quickly processed with Registax5. Next night was cloudy and on the night of 14 February i was all prepared to image the ‘pup and the dog star’ as it is famously known. With C14, DBK31 and an IR Cut filter, i began recording an AVI file with IC Capture Software. ‘Gain’ was pushed at the highest, Gamma was around 120 and frame rate was 3.75 fps. About 10,000 images were taken and the resulting file was a huge, 23 GB! Later i processed it in Registax and some teaks in CS4. To confirm that it is really a binary star of Sirius A, i shot an other AVI file of Trapezium, with the same IC Capture settings and the same camera angle but with much less frames. Here is a stack of 400 frames of Trapezium. Four brightest stars of trapezium is easily visible as well as Star E and F.
With 3.75 fps, i was able to capture 10th magnitude E and F stars so Sirius B with a magnitude of 8.5 should have been visible with my equipment and exposure settings. Next is to see if Sirius B is really in the same direction in my image, as it is supposed to be so the following charts show that current position of Sirius B and i have rotated both of these images according to my camera angle. Comparing these charts with the camera angle of my images shows a match! Another thing to notice is that the distance of Star A and B in the Trapezium is about 9 arcseconds, the same angular separation between Sirius A and Sirius B. The distance between the stars A and B of the Trapezium (above right) is the same as of Sirius A and Sirius B (above left), an other confirmation. Here are the Sirius A B and Trapezium Video Clips, if you brighten up your display as much as you can, you can spot faint Sirius B under Sirius A.
Sirius B is very important to astronomers to understand stellar evolution. 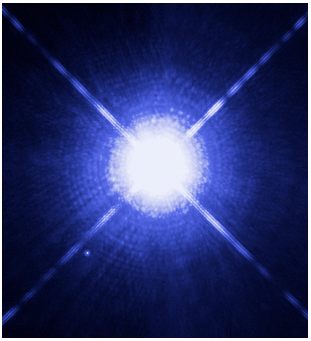 In late 2005, Hubble Space Telescope was used to image Sirius B (Above image).